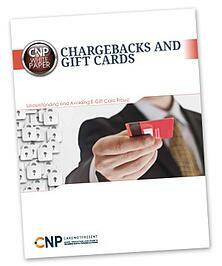 Get our white paper to learn more about the connection of chargebacks and gift cards. Understand the e-gift card landscape: Get actionable recommendations that will mitigate your risk in a channel where fraud is taking an increasingly significant bite out of revenue. This white paper examines the full scope of gift card fraud. Learn how to identify and prevent fraud schemes affecting open-loop, closed-loop and e-gift cards while maintaining a healthy sales flow.